The idea of creating a francophone network stemmed from the MontreuxConference of Heads of State and Government members of La Francophonie, hosted by Switzerland in October 2010. 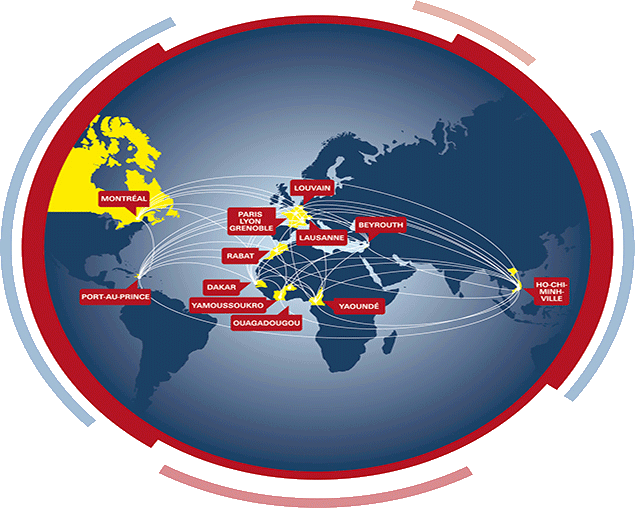 Established on the initiative of EPFL and with the official support of the Swiss authorities, RESCIF includes 14 francophone universities from 11 different countries in Africa, the Americas, Asia, Europe and the Middle East. It focuses on three key issues for the future: water, energy and nutrition. RESCIF strives to anticipate and prepare for the new wave of emerging countries and emerging universities. In these establishments, RESCIF’sinitiatives will make it possible to train young engineers in the most advanced technologies and to conduct research that will be useful for the development of these countries. The aim is to promote joint scientific programmes, particularly in the fields of water, nutrition and energy. These sectors are crucial, particularly for some countries of the South,subject to extremely challenging climate conditions and food security issues. RESCIF will work in partnership with the Francophone University Agency (AUF) and will jointly draw up good practice guidelinesfor technology partnerships to be used by all universities in emerging countries belonging to la Francophonie. In addition, all RESCIFmembers will join in a combined effort directed towards Haiti (to support institutional, scientific and educational reconstruction of the State University and the Quisqueya University of Port-au-Prince, which are also members of the network). RESCIF’s main goal is to set up a consortium of institutions that are centres of scientific excellence, relying on their state-of-the-art technological skills, and contributions from innovative industrial partners. The network’s funding and management will be in the hands of participating universities in partnership with governments and private stakeholders.